Lawn mowers are great, literally! It helps to keep your lawn & garden picture-perfect, as you can see in the advertisements. But in the realm, these tractor-shaped mowing machines are full of issues and troubles. Specially, when you get it from one of those below-standard brands. But, there are some rare exceptions like Husqvarna, who’d always met customer’s ends of price and performance. First thing first, let us tell you that, we are pretty much impressed on the power tools that Husqvarna had been making for years. But when they first stepped into lawn mowers, we were not so sure actually. You can tell why, right? Well, for ages we have seen our dads suffer from one or another issue regarding the lawn mower. There is nothing call perfection when it comes to lawn mowers. But what we eventually figured out is mind blowing indeed. In terms of performance, cutting ability, structure, power, and price- Husqvarna YTH18542 had set the bar rather high! And we mean it. Come along and let’s figure out the whole Husqvarna YTH18542 review. We’re certain that you’ll be as impressed as we are too. As you know, Husqvarna YTH18542 is a professional-level riding lawn mower. The best part of this mower is- it is smooth, super easy to use and provides you with top-notch yield. If handled properly, it will turn your cutting chores into a job of quite a minimal effort. The engine inside is from the Briggs and Stratton company and it is powered by a fuel tank of 2.5 gallons. The machine is quite fuel-efficient, so a full tank is what you need to operate with this mower several times. When we moved forward to the cutting technology, the mower left us jaw-dropped. With Husqvarna’s patented technology, it creates enhanced air induction. And that leads to smoother and more consistent cut. On top of that, the cutting deck is made out of flat-stock steel. And such a rigid material is perfect for withstanding tears and wears that come on its way while cleaning. Talking about the cutting width, it has a blade of 42 inches. So, you don’t have to ride repeatedly to clean up the lawn. In fact, this cutting depth is about double in size comparing to convenient push mowers. Let’s get back to control and usability again. The control and handy feature are one of the biggest selling points of this tractor. Specially, when the terrain surface is uneven, you will see how fruitful such controllability is. To enhance the usability, even more, the ergonomic seat of this mower is made to be adjustable. Right beneath the seat, you will find a safety switch to shut the machine down when necessary. From that, you can already see that the machine is designed to keep you out of any risk of injury. Specially, when the mower is about to get out of control. Another impressive part is the size of this model. While riding on your lawn, of course, you don’t want to carry around a hectic tractor of giant size. In this regard, Husqvarna YTH18542 will put a smile on your face. It’s compact, easy to maneuver and store in the garage. Powered by a Briggs and Stratton engine of 18.5 HP(540cc). Cutting width of 42 inches, larger than push mowers. Hydrostatic transmission for quick control within a glimpse of eyes. The spindles are made of super-durable cast aluminum. 1.5 to 4 inches of cutting height(adjustable). Fender mounted adjustment of the cutting height. Ergonomic and adjustable seat and steering wheel. Pretty much simple and easy to operate even for beginners. Clean and consistent cutting capacity. Of course, we will start with a discussion about the performance. It’s the biggest thing that us users look for, isn’t it? 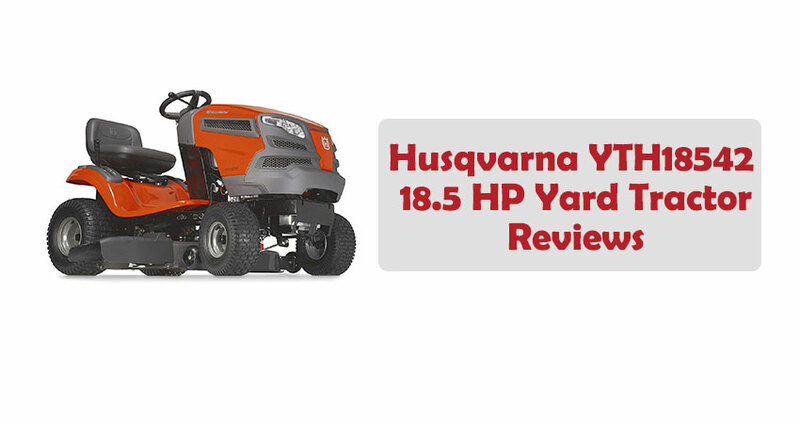 However, as you already know, Husqvarna YTH18542 is powered by a Briggs and Stratton engine of 18.5 horsepower(540cc). Comparing to the workload that this mower has to go through, the power seems perfect to go. It is practical, powerful and popularly known for outstanding durability. Apart from the engine, we’ve also found the lubrication system great. It is a full-pressure lubrication system along with a spin-on oil filter. The chance of getting jammed is, therefore, minimum for obvious reasons. When you are on the rider’s seat, many important things are automatically done for you. As an example, it automatically adjusts the speed and acceleration. All you have to do is control the hydrostatic transmission with pedals. The transmission is fully automatic. All you need to ensure proper timing. That quite depends on your mowing skills, right? Lastly, let’s talk about the turning radius. While you’re turning, it can turn at a radius of 16 inches only. So, if the yard or lawn is narrow, that’s a great advantage to work on. The cutting width is 42 inches of this mower, and it uses a couple of stamped steel blade on the deck. The 13-gauge steel has washout ports as well. Also, there are two anti-scalp wheels which are in charge of preventing the scalping when you’re on uneven terrains. The 42 inched cutting depth seems surprising for such a mower size because even the largest push mowers are not able to provide such depths. Also, you can adjust the cutting height within a range of 1.5 to 4 inches. Energy-efficient engine with 18.5 HP power. Exceptionally suitable for home users. Pretty much easy maneuvering and control. Durable and requires low maintenance. Perfect to turn around at narrow spaces. Adjustable cutting height with decent cutting depth. Safe to operate with an easy-to-access turn on the switch. Comfortable seat position and steering wheel. It’s compact and not a great fit for lands larger than 2 acres. It doesn’t come with great cruise control.